I have a Sony SR11 HD camcorder. I recently bought iLife ’09 and I’ve been trying to use iMovie ’09 to create 720p movies that I can upload to an online video service, but the results are terrible—the video’s really jaggy. What’s going on and is there a way to fix it? For those not up to speed, a little background. The Sony SR11 camcorder is an AVCHD camcorder that shoots HD at 1080i. That i means interlaced, which, in turn, means the camera captures frames as odd and even lines—first, 540 even lines from top to bottom and then 540 odd lines from top to bottom. As you might imagine, if there’s a lot of movement as the camcorder captures, you’ll get slightly different material in the odd and even fields. When that happens, you see a jagginess in the video. TVs compensate for this jagginess with circuitry that smooths the video. Computer monitors don’t have such circuitry and that’s why interlaced video looks so poor on them. Now, finally, to your problem. To export 720p video from iMovie ’08 and ’09, you choose Share: Export Using QuickTime, and you muck with QuickTime’s Movie Settings box. For example, from the Save Exported File window, choose Movie to QuickTime Movie from the Export pop-up menu, click the Options button to produce the Movie Settings window, click the Settings button in that window, choose H.264 from the Compression Type pop-up menu (you’re welcome to use a different codec), restrict data rate to 5,000 kbps (online video services suggest a data rate between 3,000 and 5,000 kbps), and click OK to close the window. Click the Size button in the Movie Settings window, choose 1280 x 720 HD from the Dimensions pop-up menu, tick the Deinterlace Source Video box, click OK to dismiss the window, click OK in the Movie Settings window, and finally click Save in the Save Exported File As window to export your video as 720p video. With iMovie ’08, you’d end up with a pretty decent looking 720p movie. But with iMovie ’09, you don’t. And the reason you don’t is because the deinterlace function isn’t working correctly. You can enable that Deinterlace Source Video option from now until doomsday and you still wind up with interlaced video. This is a problem Apple should address. Until it does, your best bet is to export your edited movie as 1080i video and then deinterlace it with another application. So, back to iMovie’s Export Using QuickTime command. Find your way to the Movie Settings window and click Settings. 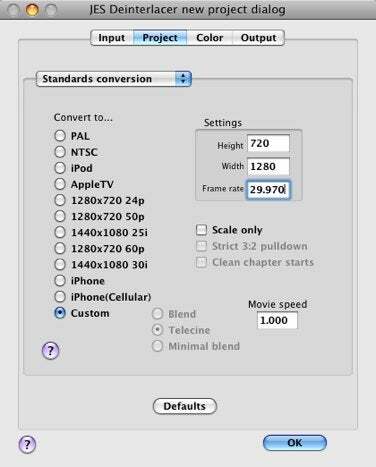 In the Settings window choose Apple Intermediate Codec from the Compression Type pop-up menu. In the Compressor area, enable the Other option, tick the Interlaced option, and choose Top Field First from the pop-up menu below. Click the Size button and in the Export Size Settings window choose 1980 x 1080 HD from the Dimensions pop-up menu. Leave the Deinterlace Source Video option unchecked and click OK to dismiss the window. Close the Movie Settings window by clicking OK, and, finally, click Save in the Export window to save your video. This will produce an enormous file—just under a gigabyte per minute of video. 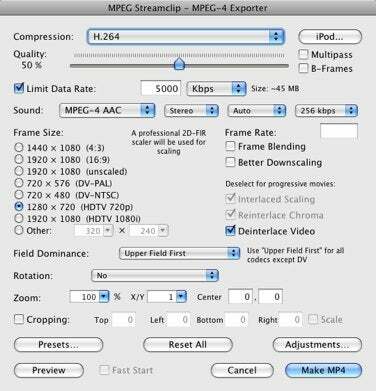 Open your file in MPEG Streamclip and from the File menu choose Export to MPEG-4. In the MPEG-4 Exporter window that appears, choose H.264 from the Compression pop-up menu, enable the Limit Data Rate option, enter 5,000 (again, for online video services), choose the 1280 x 720 (HDTV 720p) option, enable the Deinterlace Video option, and from the Field Dominance pop-up menu choose Upper Field First. Click Make MP4 and MPEG Streamclip will do just that. In JES Desinerlacer, add your file, click the Project tab, choose the Custom option, choose Standards Conversion from the pop-up menu, enter 720 in the Height field, 1280 in the Width field, and 29.97 in the Frame Rate field. Now choose Deinterlace from the pop-up menu in the Project tab and make sure Use Top Field is enabled. Click the Output tab, select QuickTime Movie in the Export pop-up menu, and do what needs doing in the Movie Settings window (choose a codec and restrict data rate, for example). Get rid of all the QuickTime windows and click the application’s OK button to begin the export. When it’s done, you’ll have your 720p deinterlaced video. For far more detail on this subject, check out this thread from Apple's Discussions Forum. Phew, again. Did I mention that it would be an excellent idea for Apple to fix this?